Drum Corps fans across the globe unite! A Facebook philanthropic program sponsored by the JP Morgan Chase Foundation has just put the key in your hands to help four World Class drum corps toward a $1 million grant. Voting starts today! This week, the competition has nothing to do with visual effects or box scores; it's all about the passionate missions of four Drum Corps International groups. Carolina Crown, the Cavaliers, Colts (incorporated as the Legion Aires) and Phantom Regiment all currently sit on a ballot among 100 organizations across the nation waiting to see if they will receive the grant of a lifetime! Advancing ahead of more than 500,000 other non-profits, these DCI ensembles each received a $25,000 grant after round one of the Chase Community Giving campaign. The program allows Facebook users to vote to decide who receives a piece of $5 million worth of charitable donations. The final round of voting kicks off today, and after its completion, one organization will walk away with $1 million. Five runners-up will each receive $100,000. You Can Vote – It's Simple! Every registered Facebook user can place up to five votes. Within the Chase Community Giving application on Facebook, individuals can review the "Big Ideas" of each of the four drum corps and the other 96 finalist organizations, detailing how they would utilize the $1 million grant. Then, with a simple click, you can cast your votes. Get the word out and Vote 4 the Drum Corps! Able to place one vote per organization and with five votes for each person, DCI and the member corps are encouraging you to Vote 4 the Drum Corps! Use four of your five votes to help each of these drum corps rise to the top echelons of the online campaign. Share the news and tell your friends! Hurry, voting ends after Friday, January 22. 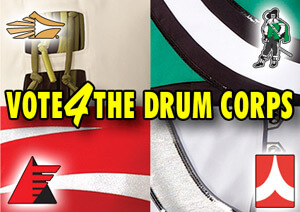 Read more about Vote 4 the Drum Corps! with links to all four drum corps' "Big Ideas."